Whether you're new in town, or just never noticed there was a second floor above your podiatrist's office, it's easy for a restaurant to slip through the cracks. Don't miss a calorie, with ToEat. 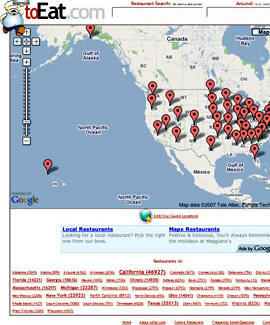 TE Google maps over 350,000 eateries from all 50 states, including Alaska, where no matter the quality, it's hard finding anything but frozen food. Enter your location, and depending on zoom-level, a magnifying glass'll mark clusters of chow locales, while closer in, individual restaurants're represented by bulbous, mustachioed cooks (reflecting the site's awesome gastronomical master: the unholy spawn of Big Boy and The Swedish Chef). You can also narrow your search by cuisine, including the standards (Asian, burgers, pizza, etc), as well as "fast food" and "buffet" -- used in tandem, a carbon-copy of Louie Anderson's ankle-tag transmissions. Though a robust framework, TE's still being filled out with menus, reviews, and photos, the latter of which'll prove true your secret suspicion -- that the fetid 2nd floor fromagerie is your podiatrist's office.